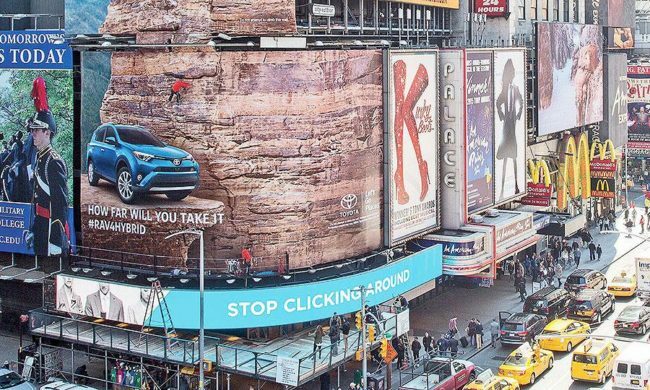 Automotive News reported the presence of a climbable billboard in the middle of Times Square in New York City. The interactive media piece was put up by Toyota USA to promote their new RAV4 Hybrid. The result was a 10-story climbable billboard in New York’s Times Square that, according to Auto News, blew through the visual clutter of the plaza and created instant buzz on social media. Getting a grip on marketing in Times Square. Photo: Automotive News. “Sometimes, you have to do something that puts some new kind of risk to it,” Jack Hollis, Toyota’s vice president of marketing told Auto News.